It may be overwhelming when you discover that there are literally hundreds of shopping spots and destinations along the Grand Strand. From specialty shops to boutiques to malls and outlets, there is definitely something for everyone who visits this fabulous coastal area. If you're looking to knock out some bargain shopping during your stay, check out the following destinations before you make the trek home! Travel down to Surfside Beach just south of Myrtle Beach to experience affordable shopping at Hudson's Flea Market. With over 430 vendor spaces, there's no guarantee of exactly what you might find while browsing this economical shopping destination. Be on the lookout for antique items, dinnerware, cell phone accessories, housewares, and much more! Whether you're just browsing or looking to find a steal, discover Hudson's Flea Market in Surfside! Located near the Myrtle Beach State Park and Market Common, the Myrtle Beach Flea Market offers shoppers the chance to browse a variety of booths and vendors in their sprawling indoor flea market. Though vendors may change from time to time, you're sure to see a range of items, from clothes to fuiture to digital accessories. You might even find a pet vendor, offering up pet supplies and small pets. If you're looking for something to do indoors and want to browse discounted items, visit the Myrtle Beach Flea Market! Head to the North end of the Grand Strand to experience the shopping experience that is Everything Under the Sun. Just as the name suggests, you'll find a wide variety of items, collectibles, antiques, and everyday products. Like the other flea markets on this list, this one features indoor booths and vendors, so you can shop anytime, rain or shine. 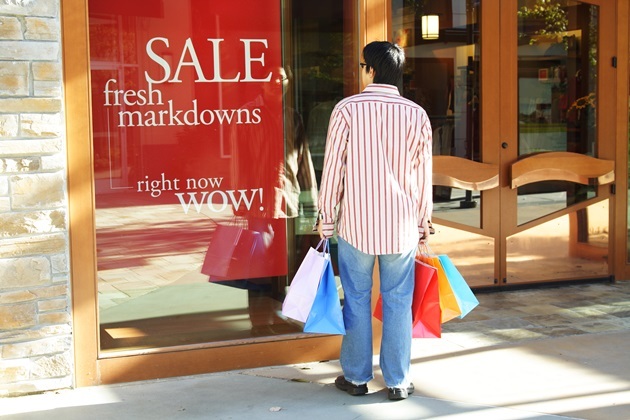 If you're not willing to cave on your name brand items but still want to save money while shopping, make a trip to TJ Maxx, Ross, or Marshall's during your Myrtle Beach vacation. At any of these stores, you'll find clothing, shoes, accessories, home goods, and more from the brands you know and love but for a fraction of the cost. Don't break the bank shopping during your next vacation rental Myrtle Beach experience; shop at the bargain stores found throughout the area! While you can definitely run up your credit card spending the day shipping at the Tanger Factory Outlets, you can also find great deals at the stores you love to visit. Look for outlet prices at Nike, Gap, Levi's, Forever 21, Aeropostale, and so many more of your favorites whenever you visit either of the two Tanger locations found along the Grand Strand. Especially during the holiday season, keep on the lookout for fantastic savings and terrific bargains at the outlet malls of Myrtle Beach. Keep more money in your wallet when you check out the best bargain shopping spots in the Myrtle Beach area. From flea markets to outlet stores, you can find great deals when you explore the affordable shops of the Grand Strand! Make your beach vacation one to remember when you take advantage of all of the top shopping destinations of the region. For stays until December 21, 2017, use our December Shop & Dine Package, where you'll receive a FREE Tanger Outlet Coupon Book and a $25 Gift Card to Divine Dining, PLUS 40% Off your accommodations. Book by December 19 to take advantage of this great offer!